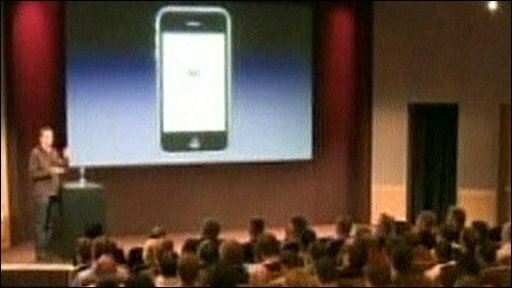 Apple has unveiled what it calls a "major update" to the operating system that drives the iPhone and iPod Touch. Some of the 100 new features included in the update replicate those already offered by other smartphones. The new functions include cut, copy and paste, long demanded by iPhone users, picture messaging and an in-phone search feature, but not Flash video. "The upgrade is a big big deal and will help persuade consumers to stay with Apple," said Gartner analyst Van Baker. "While things like copy and paste and multi-media messaging (MMS) are things they have needed to do for a while, other features will in essence stop consumers buying other smartphones and raise the amount of money people spend on the iPhone, " he said. Analyst Gene Munster from Piper Jaffray agreed that the upgrade was a major step forward. "We believe Apple addressed key issues that were leading some consumers to competing devices for multimedia messaging and enterprise e-mail." Some of the other main features Apple highlighted for consumers included a voice memo and stereo Bluetooth. A new search tool called Spotlight will allow users to search files and applications on the iPhone or iPod Touch. Alongside the consumer upgrades Apple also unveiled its SDK (software developer kit) aimed at helping engineers write applications for the devices. Apple admitted that the success of its App Store, where users can download from a choice of 25,000 paid-for and free applications, had exceeded its expectations. More than 800 million downloads have been made so far, and the company said that with the help of developers it "had created something profound and amazing." Have Your Say: What do you want from your phone? "Our goal was to make developers successful," said Scott Forstall, head of Apple's iPhone software development. Developers will now be able to use the iPhone's mapping capability in their own applications, as well as take advantage of "push" technology to alert users of messaging or alert software. Users can also now take advantage of enhanced peer-to-peer capabilities for games and other programmes that communicate wirelessly. The new software will also allow developers to sell subscription-based software products, opening up the prospect of users being asked to pay for different levels of a game, to purchase additional content or to buy virtual items. Previously, all purchases on the iPhone or iPod Touch were ring-fenced within either the App Store or Apple's mobile version of iTunes. 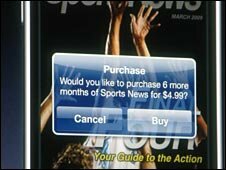 Industry analysts said the new move would be an important revenue-generator for Apple and developers. "This in-app payment capability is big news and provides a way for people to pay for content again," said Mike McGuire of Gartner. "It will be interesting to see how the print media reacts offering subscription services for magazines, newspapers and e-books. "Game developers will cash in and I am very excited to see how music services leverage this new function," he said. 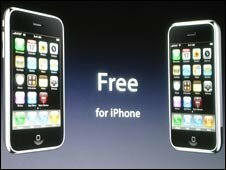 The operating system upgrade, the third for the iPhone, will be available from the summer and free to all iPhone users. Users who want to download the 3.0 software on to their iPod touch will have to pay a fee of $9.95 (£6.80). Industry watchers are speculating that a new iPhone will also be released around the same time as the software upgrade. "It wouldn't surprise me to see some new hardware come the summer," said Van Baker of Gartner. He noted that Apple was facing increasing competition from other smartphones. Gartner recently put Apple's share of the worldwide market at 10.7%, compared to Nokia at over 40% and Research in Motion, which makes the Blackberry, at under 20%. "Apple can't continue to go with a point product and expect to get the kind of revenue it needs without some new offering. A good time to do that would be when they release 3.0," said Mr Baker. At a separate question and answer session with journalists after the upgrade was unveiled, Apple's Phil Shiller said there was "nothing to announce on that today". Can Microsoft make its future mobile?